GREATER FORT LAUDERDALE, Fla. (February 7, 2019) — The richly-rooted African American heritage throughout Broward County/Greater Fort Lauderdale is never more evident than in February, when the destination’s neighborhoods, museums and culture centers join to celebrate Black History Month. Against a back drop of this year’s national “Black Migrations” theme, Broward County’s Black History month celebrates the area’s transformation into a cultural melting pot lauded for its diversity and popularity with Black travelers for vacations and family reunions. 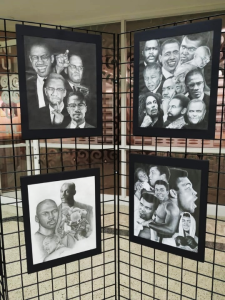 The Sistrunk A-Fair: We Love Art Too | February 1-28: Curated by Art N Soul, the We Love Art Too exhibit at the African American Research Library and Cultural Center features original works by South Florida’s Black artists. House of Slaves and Door of No Return: Photographic Exhibit | February 1-28: Broward College’s North Campus will showcase a rare photographic exhibition of famous slave castles, forts and dungeons in West Africa by artist and historian Edmund Abaka. Black History Month Block Party | February 16: Free community event offering regional live entertainment, performances, food trucks, cultural demonstrations, raffles and street hockey with the Florida Panthers. Nelson Mandela Tribute Festival | February 26: Broward College’s Central Campus will commemorate the legacy of Nelson Mandela with a festival featuring a timeline of his life, complimentary food and music. African roots are saluted at the entrance to the Sistrunk Corridor, the center of Fort Lauderdale’s oldest Black neighborhood, named after the county’s first Black doctor – James Franklin Sistrunk. Visitors are greeted by a symbolic sculpture saluting the memory of African American elders who helped found, shape, and maintain the community during difficult times in its formative years. Adjacent to downtown Fort Lauderdale, this is part of the emerging Destination Sistrunk Historical and Cultural District, an innovative zone of projects planned for economic revitalization that aim to promote historical preservation and the arts. The growing project also features a collection of wayfinding markers such as one installed at the Mount Hermon Church, the county’s oldest continuing Black congregation. 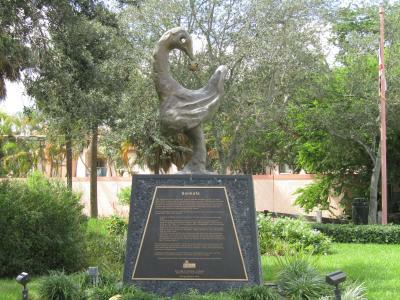 The symbolic Sankofa sculpture located at the entrance of the Sistrunk Corridor salutes the memory community founders. The Northwest Gardens neighborhood, situated near the historical Sistrunk Boulevard offers affordable sustainable housing complexes with urban farms where visitors can attend tours, or even plan for multigenerational volunteer and service-learning experiences while in town. The Megaphone, an outdoor performance venue, presents micro-festivals with local talent and at the ArtHouse, a team of culturally-diverse professional artists offers hands-on classes, workshops, and special events at a renovated neighborhood residence. The Dr. Von D. Mizell-Eula Johnson State Park, newly-renamed to honor legendary Civil Rights Movement leaders, is a popular recreational coastal attraction located in Dania Beach where Bahamian pioneers celebrate the heritage they share with the sister-community of Liberia in neighboring Hollywood. Once the county’s designated “colored beach,” the park is now a popular location for swimming, fishing, boating, hiking, bicycling and picnicking, offering a haven for visitors to escape and reconnect with nature. Greater Fort Lauderdale continues to build on its heritage to support the development of ongoing and future projects for cultural tourism. In the suburban city of Miramar, which boasts one of the largest Caribbean communities in the county and the first Haitian-American commission member, the destination is working with the American Tennis Association (ATA), the oldest African American sports organization to open the National Tennis Center. The multipurpose complex will serve as tennis education and training facility and museum to honor Black history in the sport, and is set to open at Miramar Regional Park in 2020.